Operators are always looking for an economical and environmentally sensitive way to access mature oil fields. It is a continuing source of frustration for the industry, because the two proven techniques for increasing reserve recovery; horizontal drilling and underbalanced drilling, are not economically combined with standard, jointed pipe drilling. Plus, the speed advantages of Coiled Tubing Drilling (CTD) cannot be fully exploited, because it doesn't lend itself to drilling directionally with larger hole sizes. AnTech Ltd, a directional coiled tubing drilling (DCTD) specialist, recognized that an economical solution lay in the speed and underbalanced capabilities of DCTD. 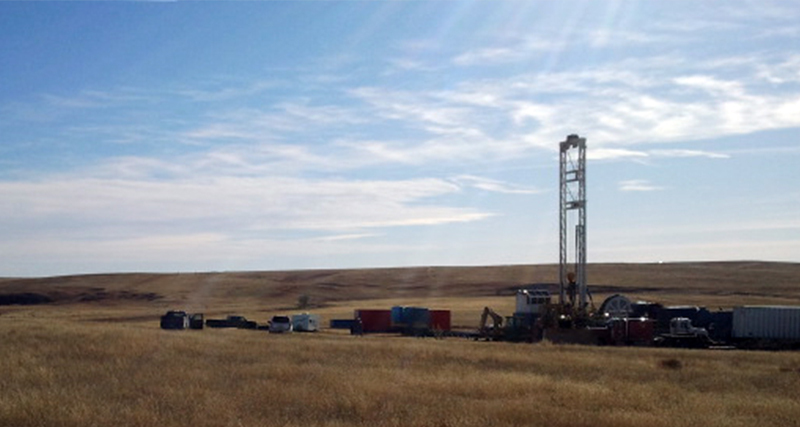 In 2009 AnTech began developing a DCTD tool that would drill larger diameter horizontal wells. The POLARIS tool is a 5-inch OD bottom hole assembly (BHA) targeted at drilling directional, S-curve and horizontal wells. It is capable of drilling in these profiles because it is steered using AnTech’s patented solid state Acrobat gyro-directional sensor that provides horizontal gyro-while-drilling (GWD) capability. With the gyro sensor located just behind the motor, quick directional feedback is produced, providing a more precise and controlled trajectory. The POLARIS tool was developed to provide a method of using CT to drill the larger hole sizes. The introduction of the solid state gyro allowed the sensor to be located closer to the bit, almost halving the length of the BHA, which is less than 40 ft overall between bit and coil connector. It also meant that the tool could be built from less expensive standard materials without the need for non-magnetic collars and without sacrificing its GWD capability. A five-well drilling campaign carried out by AnTech with the POLARIS tool in the Kansas Niobrara Formation demonstrated that the system reliably drills directional, S-curve and horizontal wells. AnTech designed the Niobrara campaign to put the POLARIS tool to the test, making certain that the challenging operation would demonstrate the tool’s ability to re-enter mature wells and economically access this shallow reservoir. To keep costs to a minimum, the surface of every well was drilled and casing set using a water well rig. Given the extremely low margins associated with the wells, no pad or access road was prepared in advance, further highlighting the environmental advantages of this particular program. During Phase 1, AnTech drilled three wells overbalanced with mud. The first well was an S-curve, while the remaining two wells were deviated to varying degrees. Throughout the drilling campaign AnTech used a hybrid drilling rig in cooperation with a CTD rig specialist. The benefit of using this type of drilling rig is that drilling time can be reduced by as much as 60%, as compared with drilling with conventional jointed pipe rig. Well 1 was an S-curve drilled to nearly 3000-ft. TVD and over 600-ft. lateral displacement.The reservoir targeted for drilling was situated beneath productive farmland. AnTech located the rig on neighbouring land, making certain to set the trajectory so that the landowner would not be disturbed.The reservoir targets of Wells 2 and 3 were situated below creeks, making it impossible to place the rig directly above the target, as a consequence deviated wellbores were drilled. In less than one day, the POLARIS tool accurately drilled Well 2 to more than 1500-ft. TVD with an average dog leg severity of approximately 7.5°. The third well was drilled near Goodland, Kansas, with over 1100-ft. TVD and 700-ft. lateral displacement. This third and final well of Phase 1 was completed as planned. All three wells drilled validated that the solid-state Acrobat gyro system reliably monitors the orientation of the tool, making it easy to accurately drill along a specific path. By using the POLARIS tool to drill directionally, AnTech accessed targets without disrupting the surrounding environment. This could not have been achieved had the wells had been drilled vertically. Located under a hill, riverbed, and bordering a cornfield, they were situated in areas without drill pads in place or access roads. The only way low margin operations such as these make economic sense is to make certain that they are mobilized and drilled rapidly. Phase 1 confirms that this is achievable. Due to the highly fractured formation that was incapable of supporting the pressure of a liquid column, air was used to drill Wells 4 and 5 in Phase 2. Using an 8-1/2-inch bit, the build sections of these wells were drilled with mud, while the horizontal sections were drilled with an air mist using a 6-1/4-inch bit. A unique benefit of the POLARIS tool is that it produces reports of downhole vibration in real time. In Phase 2, the accelerometers recorded shock spikes of up to 350g during air drilling; more specifically with the bit off-bottom. Measurements of vibration are extremely important during operations such as this, so it is critical that the equipment can withstand the punishing vibration and shock experiences when drilling with aerated fluids or in air. Well 4 was drilled horizontally to 1090-ft. TVD and over 1450-ft. lateral displacement. AnTech then executed the final operation on horizontal Well 5, drilling it to 1096-ft. TVD with a lateral displacement of 1103-ft.The final two wells drilled highlighted the effectiveness of the POLARIS tool, which successfully drilled horizontal and directional wells. Phase 1 benefited from the POLARIS tool’s ability to target a precise location within the reservoir without having to position the rig directly above the target. During Phase 2, directional CTD was used to air-drill a reservoir that was incapable of supporting a liquid column. This is an ideal example of an application where CTD has an advantage. Overall, the program illustrated that by using the POLARIS tool, it is possible to drill horizontal and directional wells with 6.25-in. to 8.5-in. holes, while using mud and an air mist as a drilling fluid. For AnTech, it was particularly significant because it was the first time that a solid state gyro had been used for directional measurement while drilling. The Acrobat gyro system generated valuable data at all inclinations, including horizontal, which meant that orientation was accurate, even in the casing. The program offers firm evidence that wells can be drilled in shallow reserves without affecting the environment or requiring heavy investment. Furthermore, it illustrates that well plans can be followed precisely. Well paths can also be enhanced by kicking off early with the gyro situated in the casing, which reduces build rates, making casing running more efficient. In addition to the POLARIS tool and the experienced CTD team, AnTech attributes its success to the hybrid drilling rig. Without the hybrid drilling rig – which runs CT and jointed pipe as well as running and pulling casing – these operations would not have been possible. Because they are so adaptable, CTD is easily achieved with a single rig, efficiently and economically. For years, CTD has been the method of choice for drilling underbalanced within a reservoir. Now that CTD can directionally drill much larger holes, fields previously thought to be inaccessible because they didn’t make economic sense to access, can be exploited, making low margin drilling operations a viable proposition. Operators should consider CTD for re-entry and development programs where the reservoir and geology conditions are uncomplicated. For those planning to carry out a standalone or wildcat project, CTD is not the answer because the benefits of efficiency and speed do not have the chance to be fully realized. Multilateral branches from the main wellbore. -Several wells from a single pad, where it is key to use the gyro orienting capability to avoid intersecting with other wells. In areas where a minimal environmental footprint is critical: commercial, residential or farming regions. In sensitive reservoirs that would experience excessive skin damage caused by overbalanced drilling. During the past 20 years, CTD has been embraced as a means of accessing untapped reservoirs, particularly in Alaska, Russia and Saudi Arabia for directional wells and Canada and the Lower 48 for vertical wells. Currently, there are CTD operations being undertaken in Malaysia and Australia. Given the cost-savings, speed, and environmental benefits it provides, DCTD is gathering wider market acceptance. With the arrival of new technologies, such as the POLARIS tool that drills simple shallow wells to multiple wells from a single pad, directional CTD’s time has come.